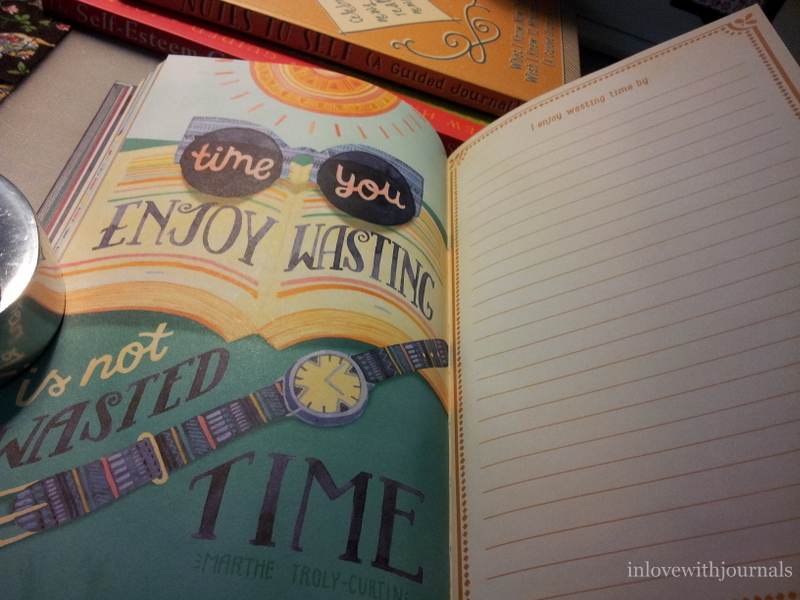 amazon, be yourself, catharine sutker, matthew mckay, notes to self, self-esteem guided journal, studio oh! Last Sunday David and I went to Inglewood (an artsy neighborhood here in Calgary) and I went to a store moving sale; Suzi Q Beads is moving into another artsy neighborhood and they had 20% off all of their stationery. So I picked up a couple journals of the self-guided variety. And recently I bought a self-esteem guided journal on Amazon so I thought I would throw that in here too. The Notes to Self and the Be Yourself journals are published by Studio Oh!. The Self-Esteem Guided Journal is published by Raincoast Books. Both of the Studio Oh! journals are fun and a trifle tongue-in-cheek, whereas the Self-Esteem journal is quite serious. Self-guided journals are fantastic for those who might have trouble finding things to talk about in their journals (the number one reason people stop keeping a journal). They are also good for those of us who prefer to stick to the surface in our journals, never delving too deep into our emotional minefield. These journals are designed to get you thinking and working through some heavy stuff, sometimes in a light-hearted way like with the Studio Oh! 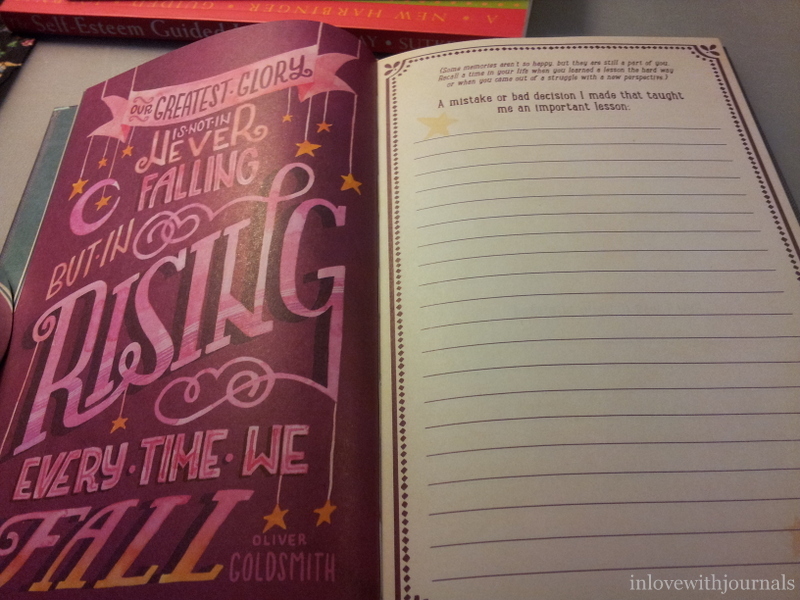 journals, and sometimes in a more serious and directed way, like the Self-Esteem journal. All have value for spiritual and emotional growth and can really liven up your writing by kick-starting you creatively. I often start to write in the space allotted in these journals and then end up with 10 pages in my day-to-day journal. They make you think!! 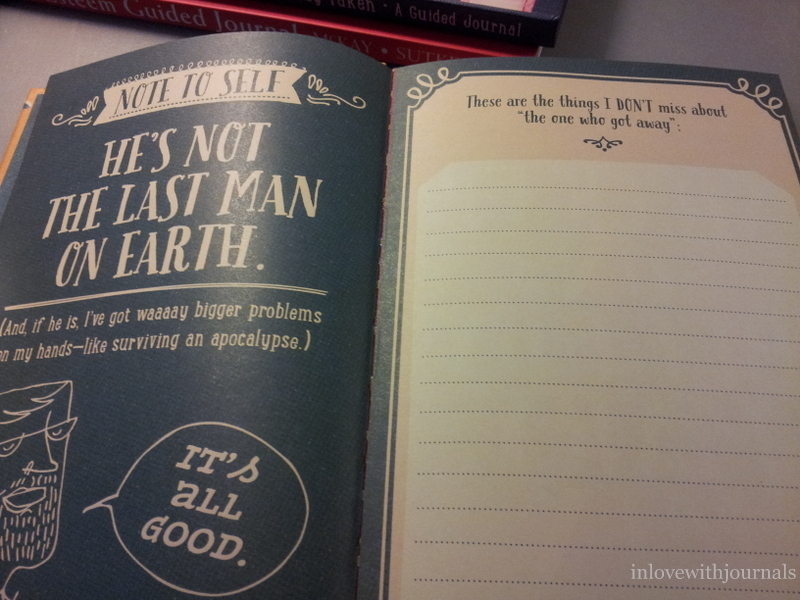 The Notes to Self journal has a definite nod to dating and the single woman. This layout on the very first page doesn’t really pertain to me at all; I married the one that would have been categorized as the “one that got away”. But the illustrations and the message behind this journal prompt are great; don’t dwell on missed opportunities and try to see them in a different and perhaps more realistic light. This one I could sink my teeth into. We all need to stop beating ourselves up about something. Positive reinforcement all the way. The Be Yourself journal has a similar look and feel. This is one of the first layouts you see. Great quote and great message: learn from our mistakes. Our mistakes and/or “bad” decisions are what makes us who we are today. Another great quote with a beautiful illustration. We might think the things we love to do are wasting time but they have value and are an important grounding factor in our lives. Celebrate wasting time! 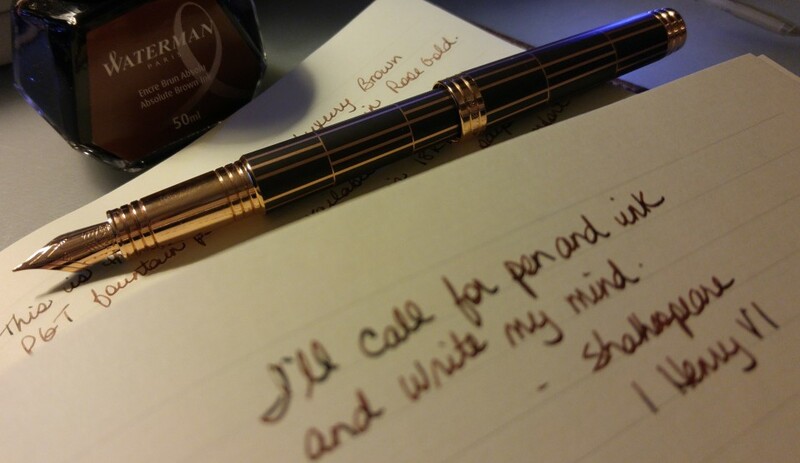 I really love this journal. 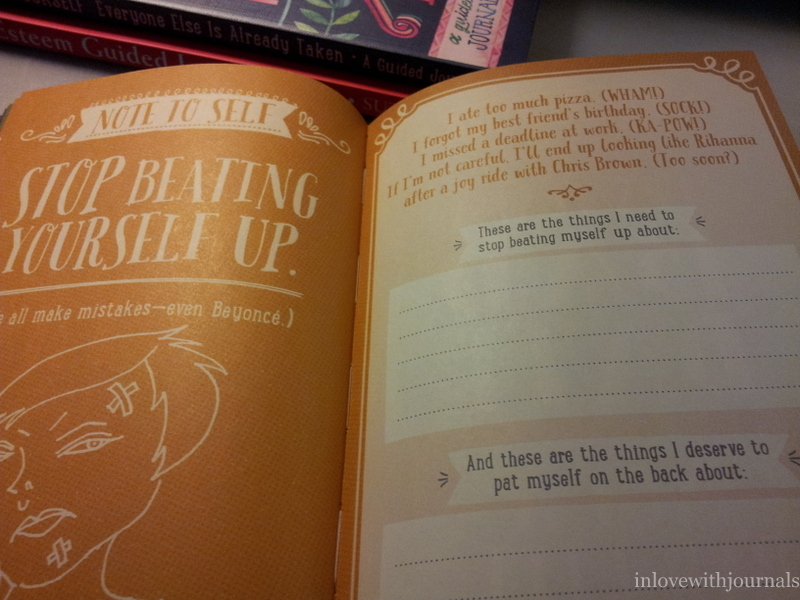 As I said previously the Self-Esteem Guided Journal is a lot more serious than the other two. The authors, Matthew McKay and Catharine Sutker, encourage you to commit to their 10-week program to enhance your self-esteem and discover new truths about yourself. No matter how healthy you may be emotionally there is definitely some work here to be done for everyone. 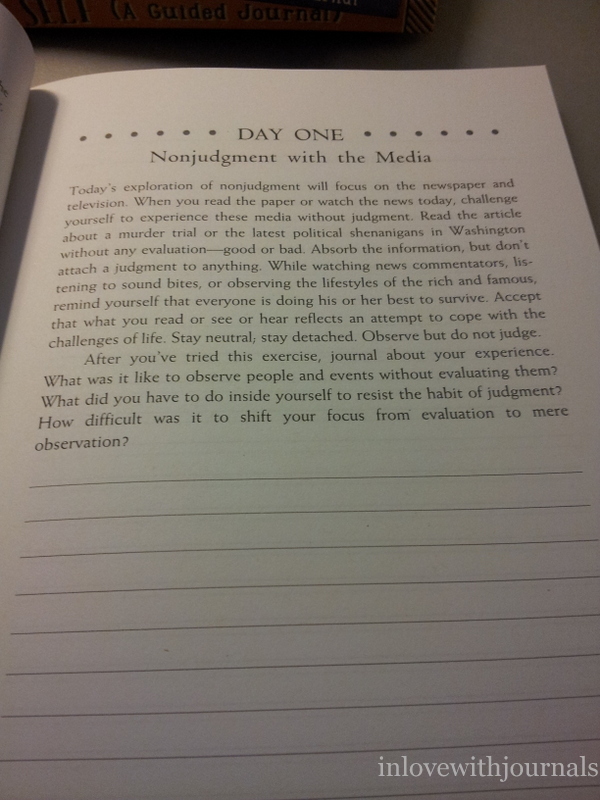 This ten-week program begins with a week practicing and journaling about nonjudgement – regarding everything from people in the news to your own behavior. Weeks two and three will focus on discovering your strengths and redefining weaknesses. Weeks four and five will review your past and how if affects your self-esteem. During week six we will clarify your deepest values and explore the ways you act on them. Week seven focuses on the impact of your thoughts. The Buddha said: “Nothing does more damage than our own unwise thoughts.” You will learn and practice six specific ways to change judgments that destroy self-esteem. Week eight will focus on how to hold to your truth and stand up for yourself. In week nine you will explore and journal about experiences with your self-esteem Achilles heel. Week ten will create daily opportunities to experience your worth and will be a launching pad for your future journal activities. There is a fairly large amount of space for you to write; the lined bit continues onto the next page and covers the entire page. 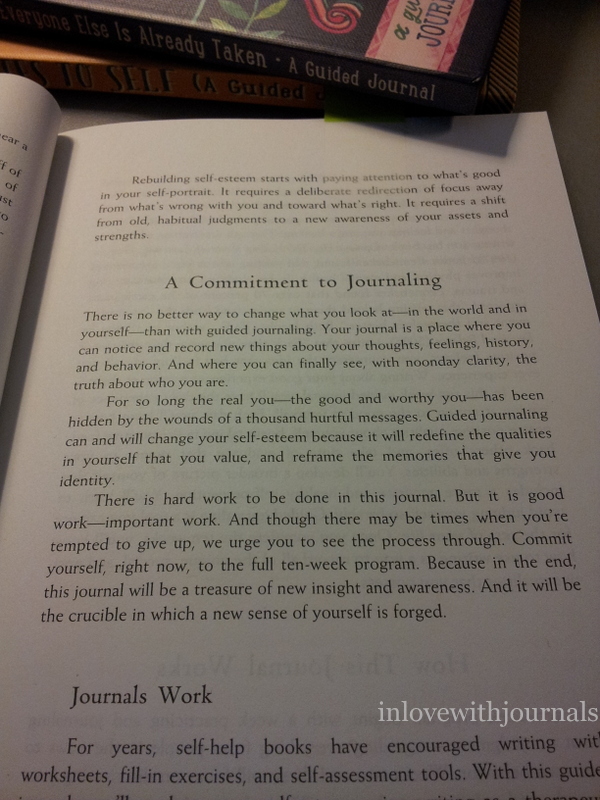 I particularly like this journal prompt as I will be talking about journaling ha ha! And writing in general, like this blog or poetry or short stories. It is so important to find something we are passionate about; we must do it for our souls, whether it makes money or not, whether other people approve or not. It is a necessity our souls demand.